Direction sign to Paradox, 1, Colorado. 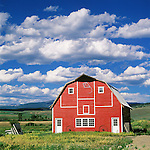 Red barn in field in central Colorado. Two red barns in a meadow by the forest, Colorado.